Morris, William. Life and Death of Jason. Roberts Brothers, Boston (1867). Morris, William. Life and Death of Jason. Bell And Daldy, London (1867). 500 copies printed. Morris, William. The Earthly Paradise. Roberts Brothers, Boston (1868). A Poem; Includes March Atlanta's Race, The man born to be King, April The Doom of King Acrisius, The Proud King. May The story of Cupid and Psyche, The Writing on the Image. June The Love of Alcestis, The Lady of the Land etc. Morris, William. THE LIFE AND DEATH OF JASON. Bell and Daldy, London (1868). Magnusson, Eirikr. VOLSUNGA SAGA. F. S. Ellis, London (1870). 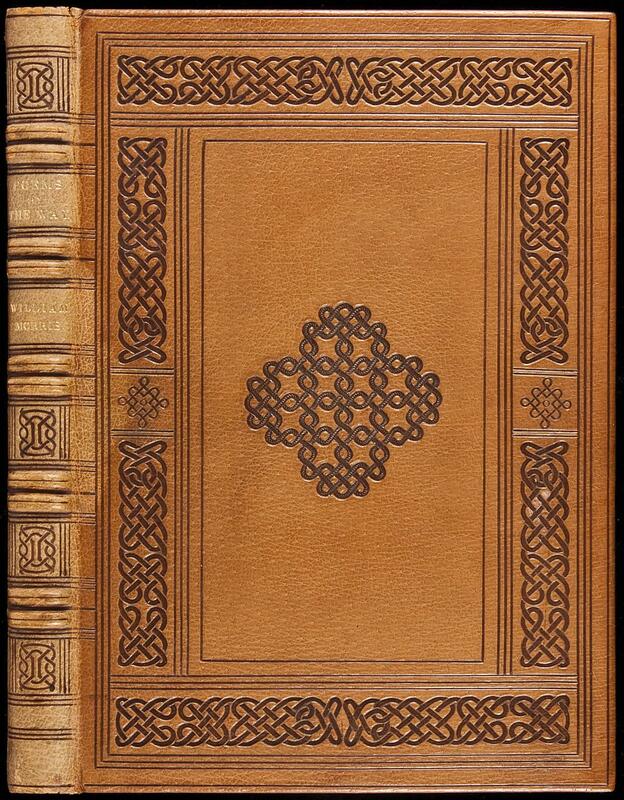 William Morris (transl.s), and Philip Webb (cover design); THE STORY OF THE VOLSUNGS and NIBLUNGS WITH CERTAIN SONGS FROM THE ELDER EDDA; TRANSLATED FROM THE ICELANDIC; 750 copies printed. Morris, William. The Earthly Paradise. Roberts Brothers, Boston (1871). Part IV; 1000 copies. Morris, William. The Earthly Paradise. Ellis and Green, London (1872). A Poem; Complete in Ten Parts. Morris, William. Three Northern Love Stories. Ellis and White, London (1875). and other tales; Tales include 'The Story of Gunnlaug the Worm-Tongue and Raven the Skald'; 'The Story of Frithiof the Bold'; 'The Story of Viglund the Fair';'The Tale of Hogni and Hedinn'; 'The Tale of Roi the Fool' and 'The Tale of Thorstein; 500 copies printed. Morris, William. The Story of Sigurd the Volsung. Ellis and White, London (1877). and the Fall of the Niblungs. 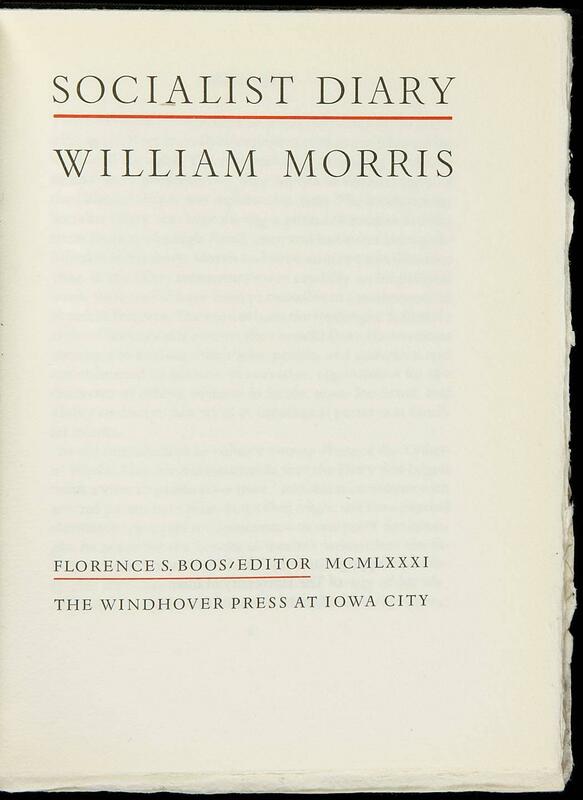 Morris, William. The Life and Death of Jason. Ellis and White, London (1882). A Poem; Eighth Edition, Revised by the Author; 25 large paper copies. Morris, William. THE AIMS OF ART. Office of `The Commonweal', Farringdon Road (1887). Morris, William. The Odyssey Of Homer. Reeves and Turner, London (1887). 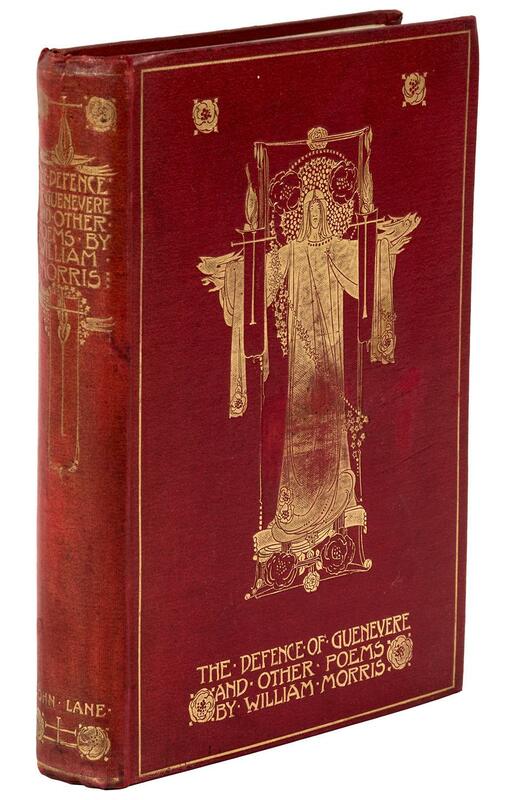 Done Into English Verse By William Morris; 2 Volumes; 50 large paper copies; Illustrated by morris. Morris, William. Signs of Change. Reeves and Turner, London (1888). Seven Lectures Delivered on Various Occasions. Morris, William. A Tale of the House of the Wolfings. Chiswick Press, London (1889). And All the Kindreds Of the Mark Written In Prose And In Verse By William Morris; 100 copies printed. Morris, William. A Tale of the House of the Wolfings. Roberts Brothers, Boston (1890). and All the Kindreds of the Mark Written in Prose and in Verse by William Morris; 500 copies printed. 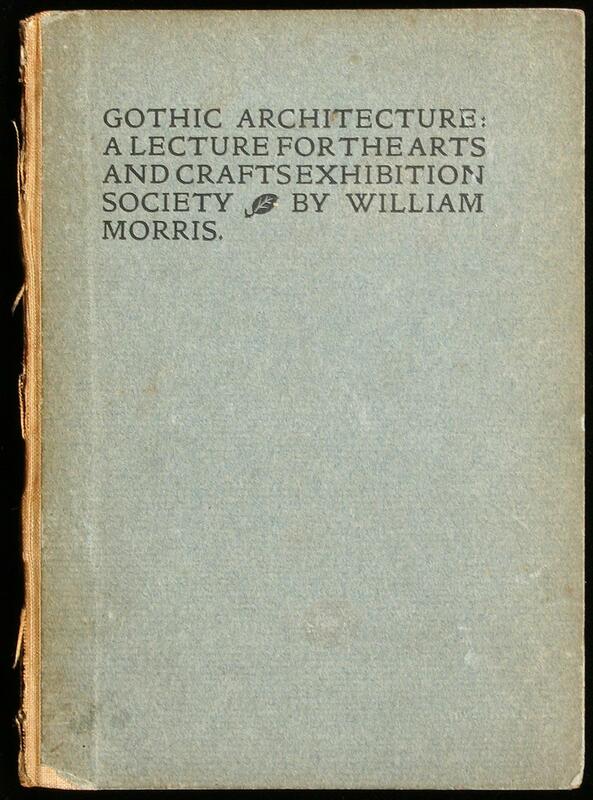 Morris, William. News From Nowhere. Reeves and Turner, London (1891). Or An Epoch of Reset, Being Some Chapters From a Utopian Romance; 250 large paper copies. Morris, William. Poems by the Way. Kelmscott Press, Hammersmith (1891). first page of text within a woodcut border designed by Morris, six and ten line woodcut initials; 300 copies printed. Morris, William. Poems by the Way. Reeves and Turner,London (1891). 100 copies printed. Morris, William. The Story of the Glittering Plain. Kelmscott Press, Hammersmith (1891). 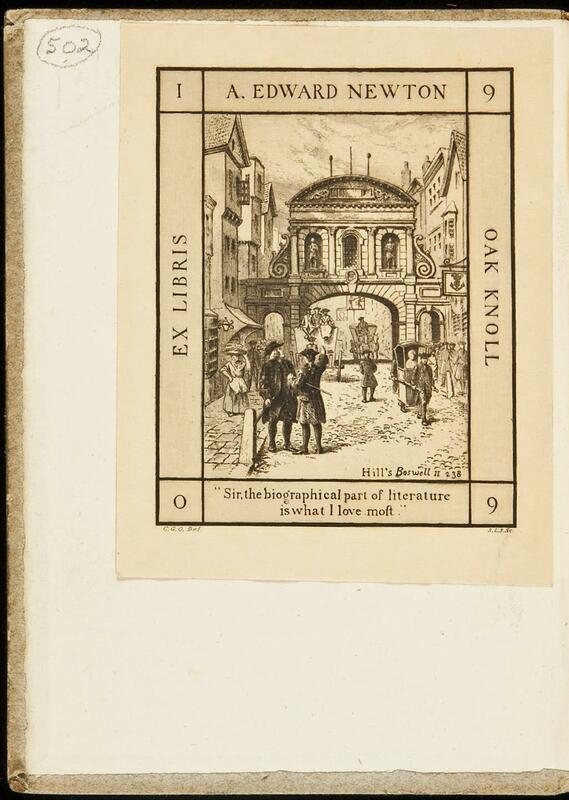 or the Land of Living Men; With woodcut ornamental border and several woodcut initials after William Morris; 200 copies printed. Morris, William. Gothic Architecture. Kelmscott Press, Hammersmith (1893). A Lecture for the Arts and Crafts Exhibition Society; Woodcut blocks used for initial paragraph letter and leaf designs on numerous pages; Edition limited to 1500 copies printed on paper and an additional 45 on vellum. Morris, William. Of the Friendship of Amis and Amile. 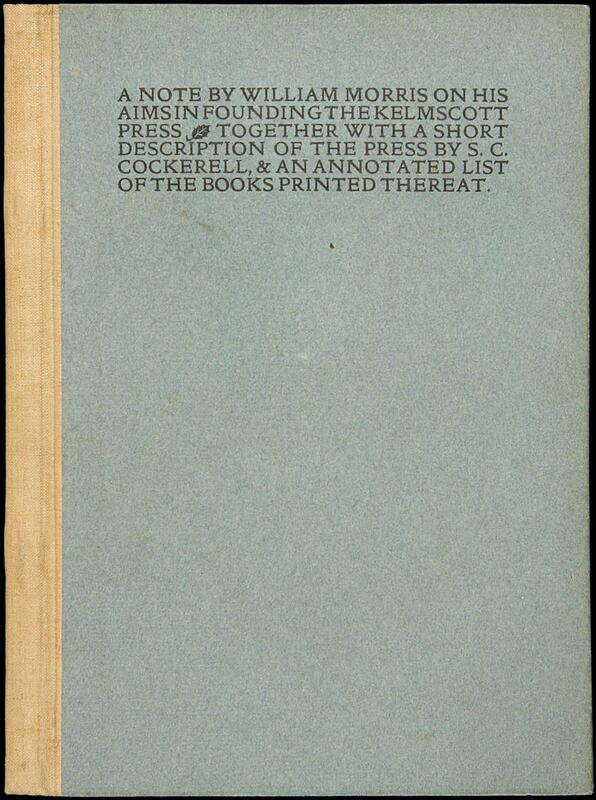 Kelmscott Press, London (1894). Translated By William Morris; wood-engraved title designed by Morris with double-page vine-leaf border; Beautifully bound by Henry Wood in Blue crushed morocco; 500 copies. Morris, William. The story of the Glittering Plain. Kelmscott Press, Hammersmith (1894). 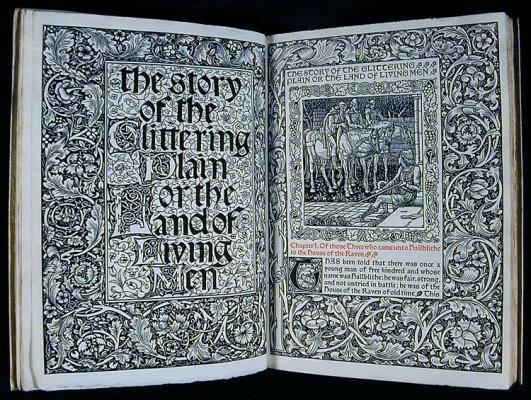 which has been also called the land of living men or the acre of the undying; woodcut title designed by Morris and first leaf of text with elaborate decoration and woodcut vignette, 22 woodcut vignettes as chaper headings (first chapter only with vignette tail-piece) by Walter Crane and decorative woodcut marginalia throughout; 250 copies. Morris, William. Child Christopher and Goldilind the Fair. 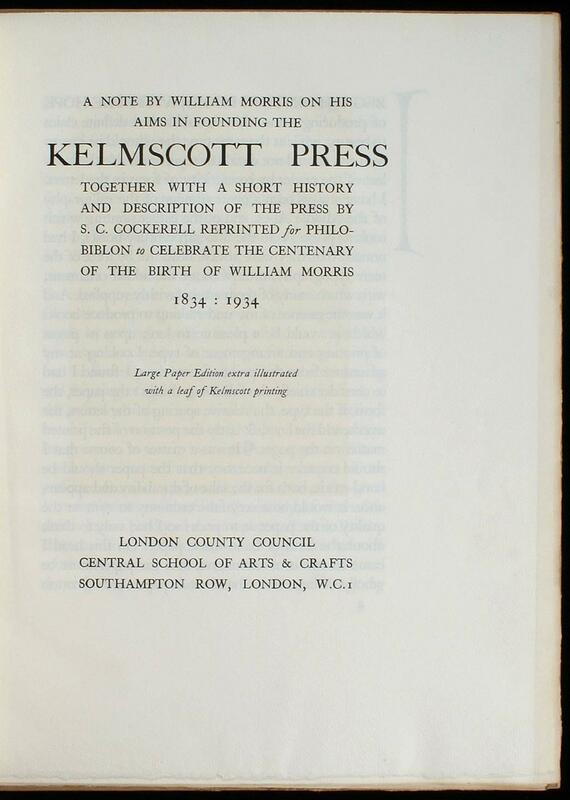 Kelmscott Press, Hammersmith. (1895). 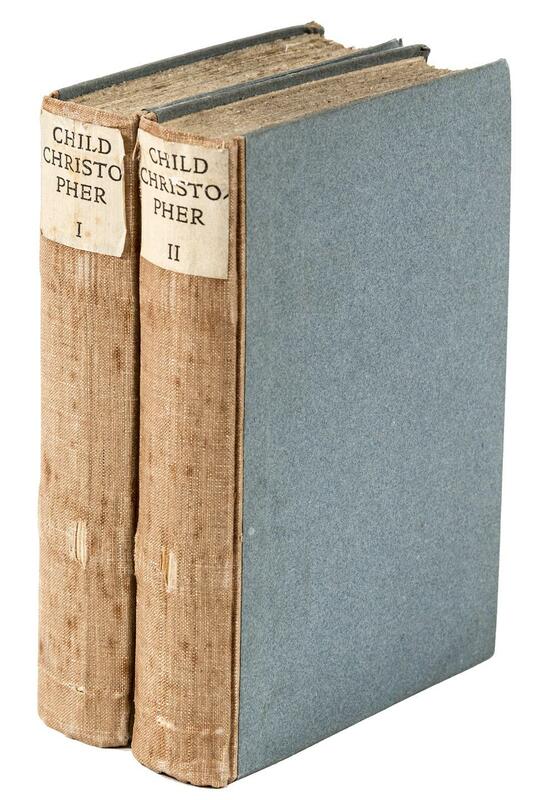 2 volumes ; 600 copies printed. Morris, William. Good King Wenceslas. Cornish Brothers, Birmingham (1895). A Carol Written By Dr. Neale and Pictured and 6 fine plates by Arthur Gaskin By Arthur J. Gaskin with An Introduction By William Morris; 125 copies. Morris, William. 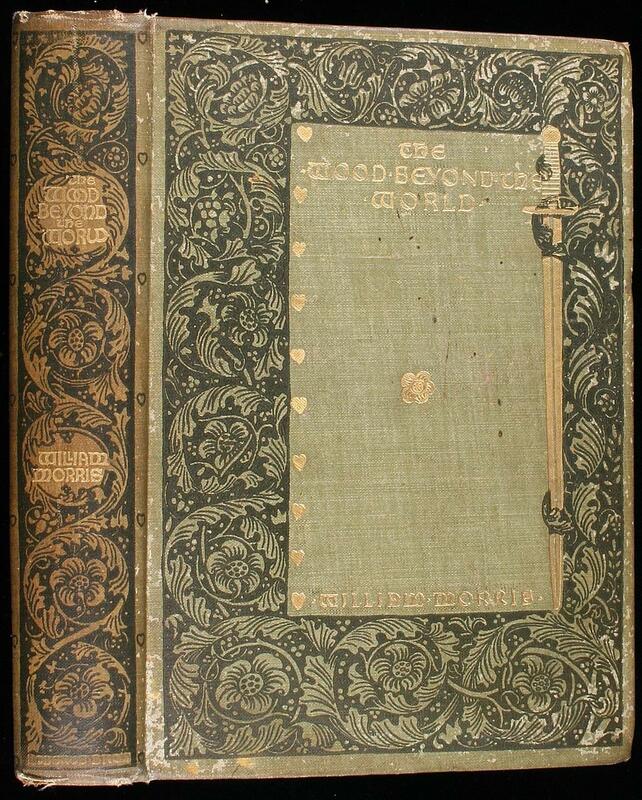 The Wood Beyond the World. William Heinemann, London (1895). Morris, William. The Wood Beyond the World. The Roberts House, Boston (1895). 500 copies printed. Morris, William. Earthly Paradise. Hammersmith (1896). 225 copies printed. Morris, William. THE WELL AT THE WORLD'S END. Longmans, Green, and Co., New York (1896). A TALE; 2 volumes. Morris, William. THE WATER OF THE WONDROUS ISLES. Longman's, Green, New York (1897). Morris, William. Water of the Wondrous Isles. Kelmscott Press, Hammersmith (1897). 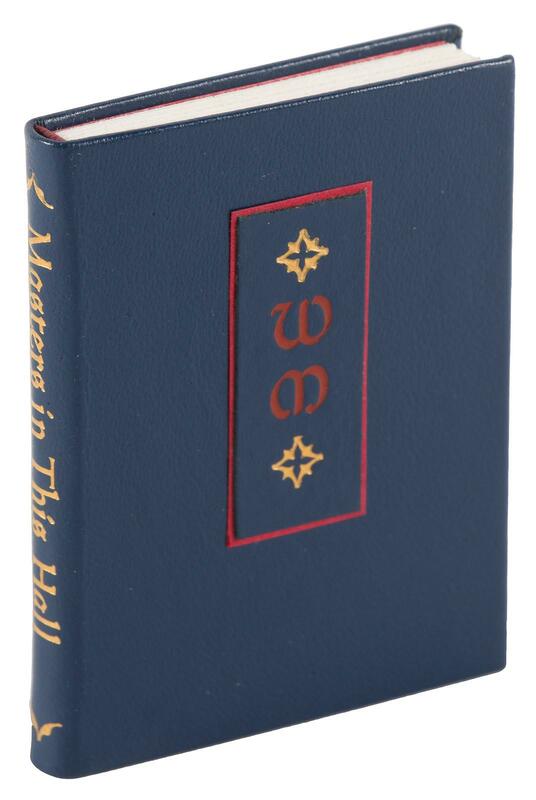 256 copies printed; Embellished with decorative woodcut borders, ornaments, and initials all designed by William Morris, except for two large initial words Whilom and Empty, which were completed from his unfinished designs by R. Catterson-Smith. Morris, William. 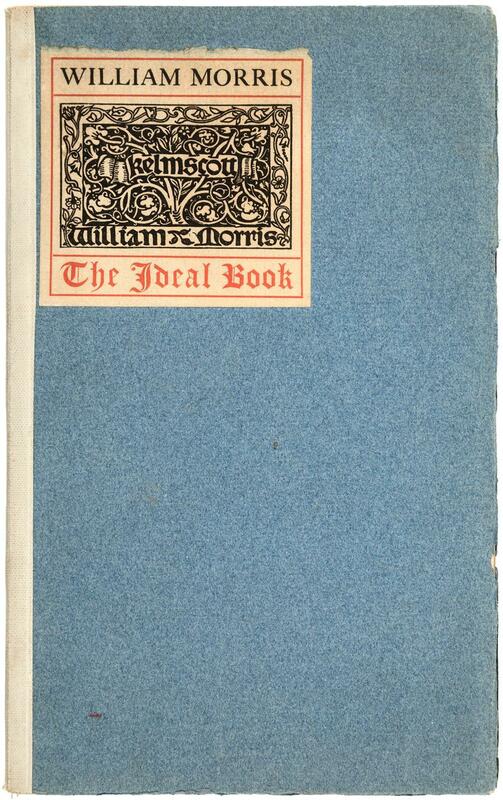 A Note By William Morris on His Aims in Foundiing the Kelmscott Press. Kelmscott, London (1898). Together with a Short Description of the Press By S.C. Cockerel, and An Annotated List of the Books Printed Thereat; 525 copies printed. Jordan, David Starr. Seal and Salmon Fisheries and General Resources of Alaska. Government Printing Office, Washington (1898). Henry Wood Elliott; Washburn Maynard; Sheldon Jackson; William Gouverneur Morris; Ivan Petroff; Charles Haskins Townsend; Frederick William True; John Brice; Leonhard Stejneger; Four 4 Volumes; Complete Set, 4 Vols; Profusely illustrated with: Vol 1 - 5 b/w photo plates (1 folding), 2 folding lithograph charts; Vol 2 - not illustrated; Vol 3 - 77 b/w plates from drawings (most are double-page), 23 b/w photo plates, 15 chromolitho maps (most are double-page), large folding map printed in colors; Vol 4 - 10 b/w plates after drawings, 92 b/w photo plates (many with 2 or more images), 26 large folding maps printed in colors, 6 double-page maps printed in colors, 8 chromolithographs of native peoples, 4 charts; 3000 copies printed. Morris, William. Some Hints on Pattern Designing. Chiswick Press, London (1899). Contains 6 fugitive lectures and 1 essay; 2000 copies printed. Morris, William. A Tale of the House of Wolfings, and All the Kindreds of the Mark. Chiswick Press, London (1901). WRITTEN IN PROSE AND IN VERSE; 300 copies. Mackail, J W. AN ADDRESS DELIVERED THE XITH NOVEMBER MDCCCC AT KELMSCOTT HOUSE HAMMERSMITH BEFORE THE HAMMERSMITH SOCIALIST SOCIETY. Doves Press, London (1901). Mackail, J.W. WILLIAM MORRIS. Doves Press, Hammersmith (1901). 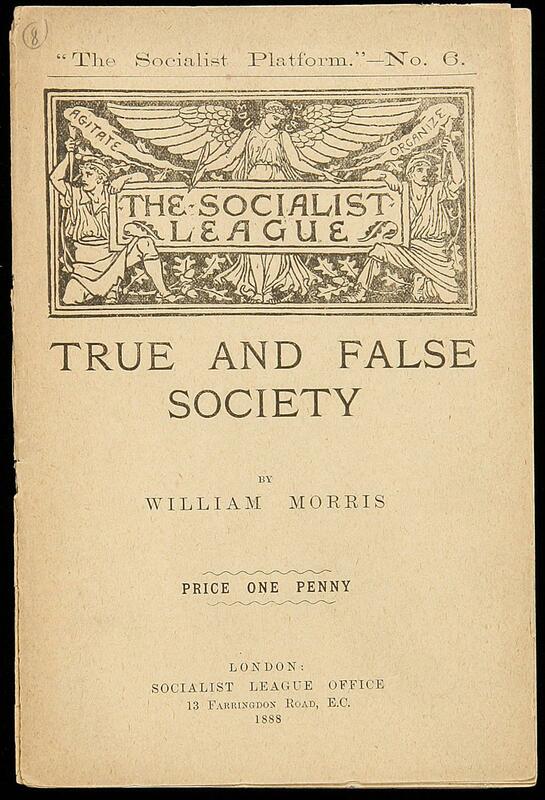 AN ADDRESS DELIVERED THE XIth NOVEMBER MDCCCC (1900) AT KELMSCOTT HOUSE HAMMERSMITH BEFORE THE HAMMERSMITH SOCIALIST SOCIETY; 300 copies printed. MACKAIL, J.W. An address delivered the XIth November MDCCCC at Kelmscott House Hammersmith before the Hammersmith Socialists Society. Chiswick Press, London (1902). Morris, William. Five Arthurian Poems. Elston Press, New York (1902). The Defence of Guenevere; King Arthur's Tomb; Sir Galahad, A Christmas Mystery; The Chapel in Lyoness; A Good Knight in Prison; 178 copies printed. Morris, William. Collected Works. Longmans, Green and Co, London (1910). 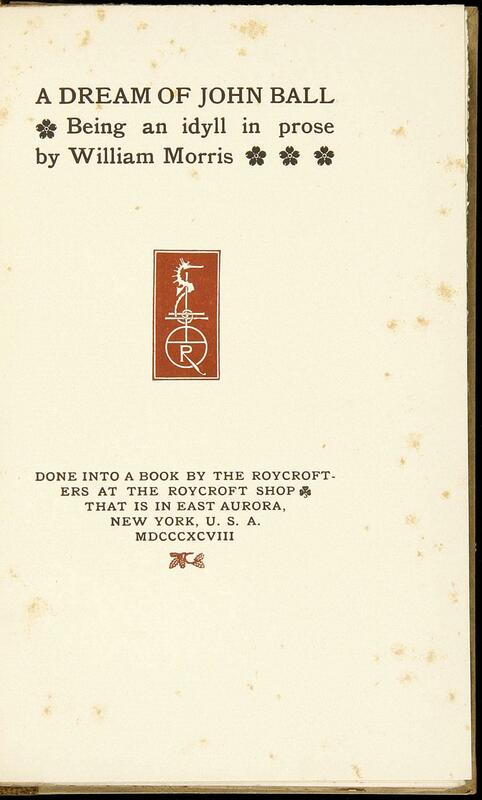 Wih Introductions by his Daughter May Morris; 24 volumes; 1050 copies printed. Morris, William. Early Poems. Glasgow and Bombay, London (1914). 16 coloured plates tipped in, with tissue guards also numerous black and white illustrations by Florence Harrison. Morris, William. Guenevere. 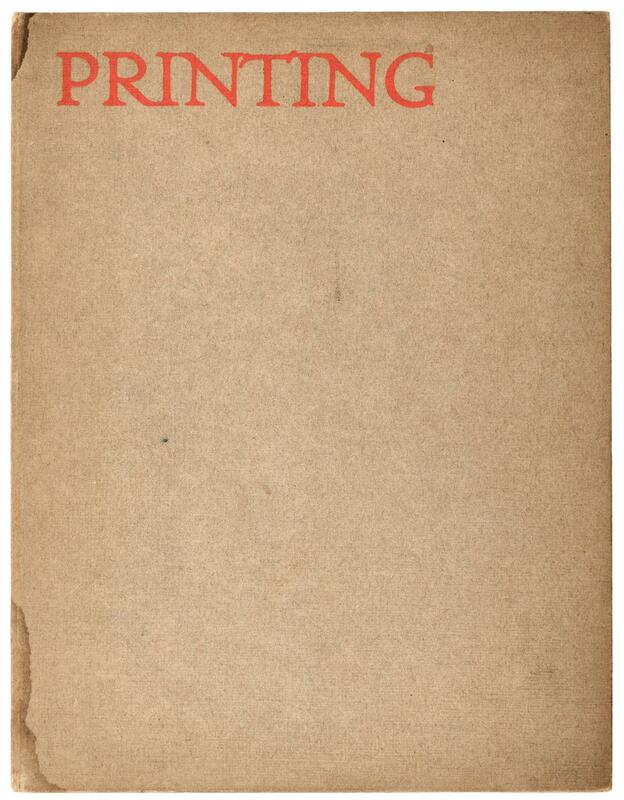 Fanfrolico Press, London (1930). TWO POEMS; THE DEFENCE OF GUENEVERE AND KING ARTHUR'S TOMB; illustrated with eight collographs from drawings by Dante Gabriel Rossetti; Foreword by Gordon Bottomley; 450 copies printed. Morris, William. 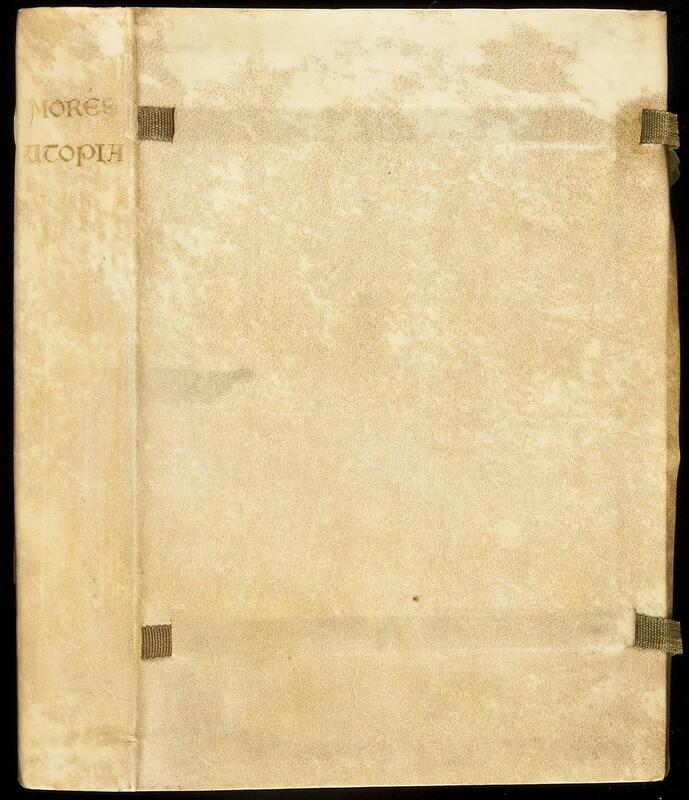 SOME THOUGHTS ON THE ORNAMENTED MSS. Press of the Woolly Whale, New York (1934). 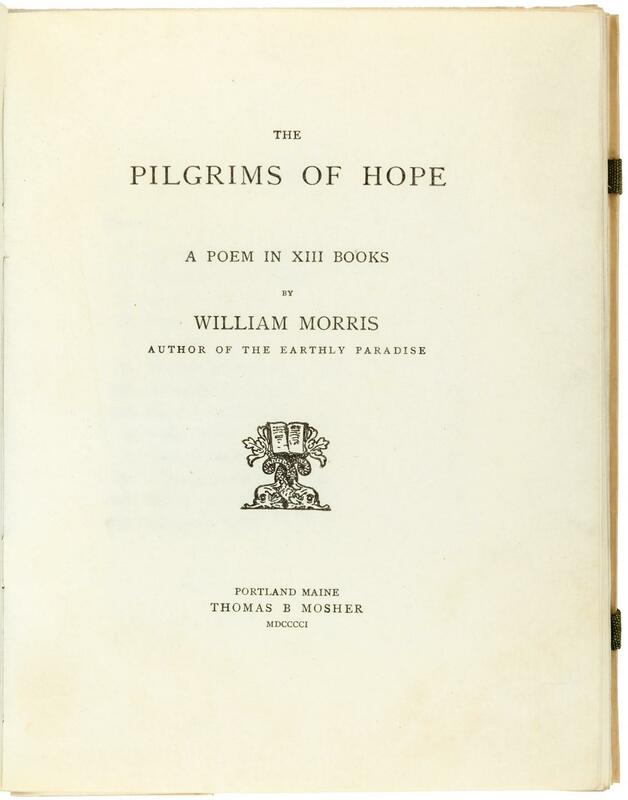 of the Middle Ages, printed on his Albion Hand Press, with an account of its travels from the closing of the Kelmscott Press to the present day. Morris, William. The Story of Cupid and Psyche. Rampant Lions Press, London and Cambridge (1974). Vol. 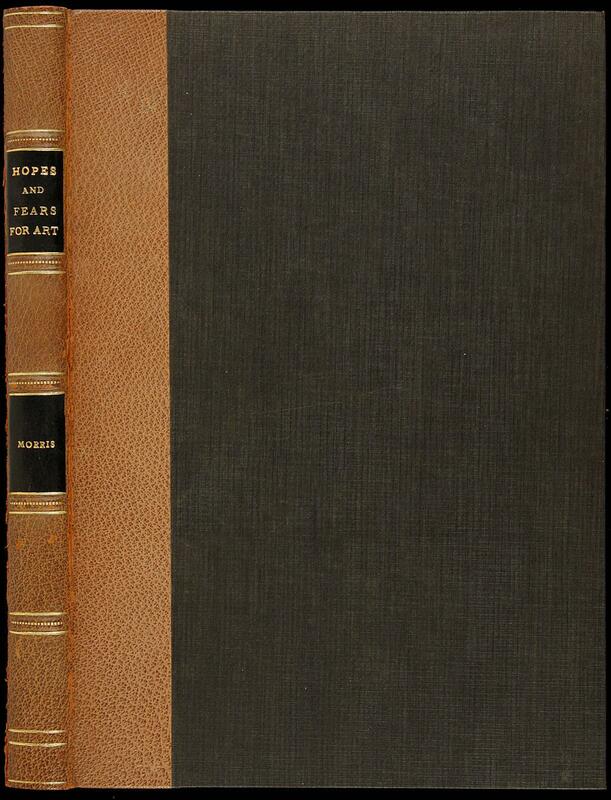 I: Introduction by A. R. Dufty. A� Vol. II: The poem with the engravings. The Portfolio; Forty-four illustrations designed by Edward Burne-Jones, mostly engraved on the wood by William Morris; 270 copies printed. Introduction by J.R. Duffy; Volume I with text by Duffy and 26 plates of collotype reproductions of drawings and preliminary prints by Morris and Burne-Jones, Volume II with illustrated text printed in Kelmscott Troy. Morris, William. A BOOK OF VERSE and A BOOK OF VERSE. Scolar Press, London (1980). Limited to 325 copies; 2 volumes; Contributors include the art of Edward Burne-Jones Charles Fairfax Murray and George Wardle. Morris, William. A Book of Verse. Scolar Press (1981). A Facsimile of the Manuscript Written in 1870 by William Morris; 62 copies. Blades, William. Rarities of Numismata Typographica. Bird and Bull Press, Newton (1996). Henry Morris; Four Examples of Early Dutch Printers' Bookbinders' and Booksellers' Guild Medals, Cast in Sterling Silver from Original Specimens; 120 copies printed. Kelvin,Norman. 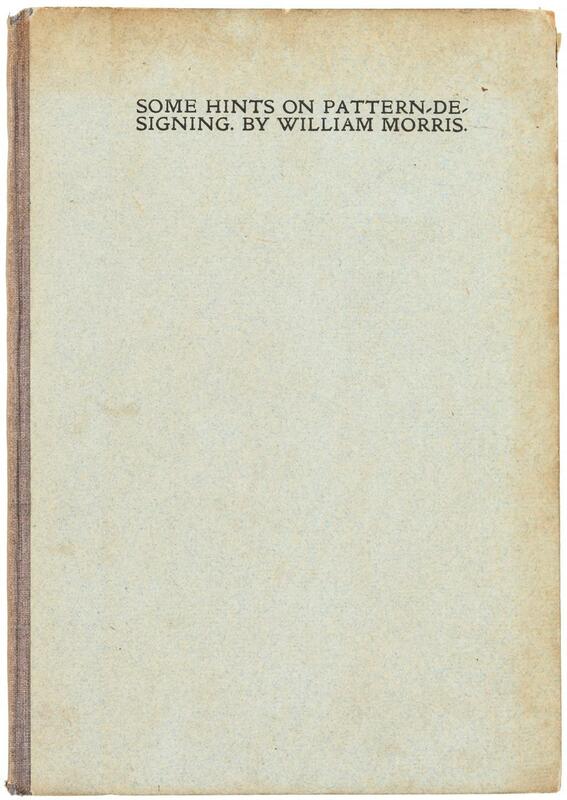 The Collected Letters of William Morris. Princeton University Press (1996). 5 volumes. Morris, William. The Earthly Paradise. Taylor Francis Inc, United States (2002).